The action starts at noon with a super-sized kick-off at the Academy of Music where “Circus Wonderland” promises to delight and amaze, and the Expandable Brass Band serenades. A special 1 pm show of Paintbox Theatre’s “Tarzan” takes the audience on a swing through the jungle at Theatre 14. By 2 pm, the First Night party is in full swing. The afternoon offers a cornucopia of dance, puppetry, a cappella voice, classical trios, quartets, and duos—not to mention a guitar orchestra and the customary full plate of entertainment designed for young children. Back by popular demand, the Valley Light Opera makes a second First Night appearance with performances of “Zoo” at 4 and 5 pm. Fireworks at 6:15 cap the afternoon and signal the start of the evening entertainment. After that, the festivities feature more magic and merriment—including an incredible line-up of bands at the Academy where Monte and Joan of 93.9 The River emcee the stage for rock wonders And the Kids and folk marvels Darlingside. Wanna dance? Take a stroll down Conz Street to catch the world beat rhythms of the Pangeans or party out with Trailer Park at the World War II Club. Move to the reggae of Rebelle in First Night’s newest venue, the Arts Trust Building at 33 Hawley Street. The Parlor Room presents the chamber pop of The Winterpills, and the indie-rock quartet Bunk is at TD Bank. Bunk at the Bank! 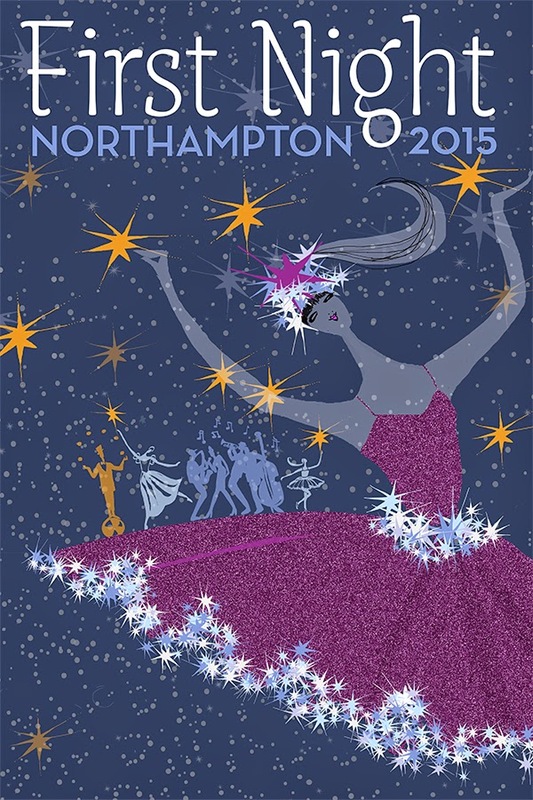 As midnight approaches, it’s time to gather at the Hotel Northampton for the iconic raising of the ball. For the 30th anniversary of First Night Northampton, Johnny Memphis broadcasts the best party hits of 1985 on to King Street starting at 11:30. A single bargain-priced button opens the doors to every event at every venue. Buttons are good all day and evening on December 31. They cost $16 for adults if purchased by December 30. The price goes up to $20 on the day of the event. There are special prices for seniors 65+($10) and kids 2-10 ($8). There’s also a $10 Adult Day Only button that’s good until 6 pm. Kids under 2 are free. Buttons may be purchased online (no fees) or at area sales vendors listed at www.firstnightnorthampton.org. The First Night website also includes a complete schedule of events and details about each performance. The First Night poster is an original illustration by Gayle Kabaker with graphic design by Alexis Neubert. Also attached are images of Circus Wonderland and East Street Ballet. Additional photos of performers available upon request.